The most amazing recipe for Shrimp Eggplant Recipe in Creamy Sauce. This will become your new favorite eggplant recipe. 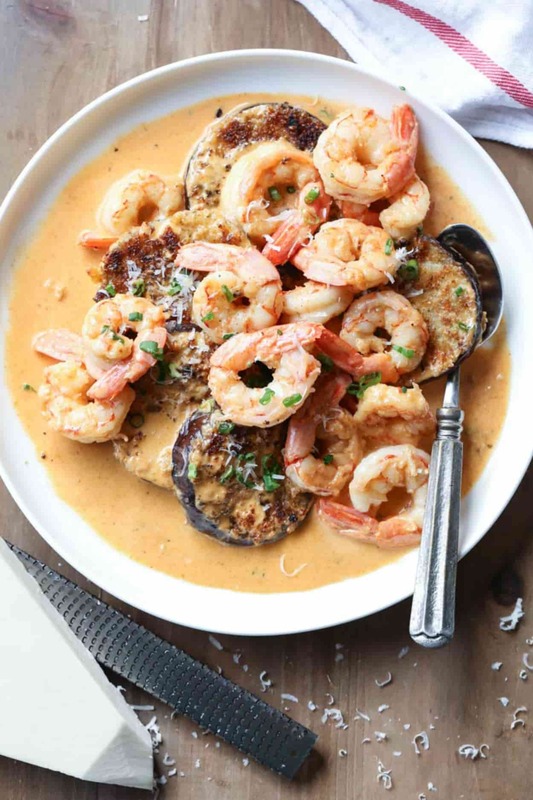 Breaded parmesan panko eggplant with shrimp in a spicy (Cajun like) creamy sauce, ready in under 30-minutes.Winner! We were recently at a Women’s Retreat (see post HERE). We went out for lunch one day. We ordered different types of appetizers and that when I tried their Spicy Shrimp & Eggplant appetizer (this copycat Shrimp Eggplant in Creamy Sauce). It literally was one of the most amazing dishes I’ve tried in a really long time. I tried recreating it the first day I was back, I was hooked. And two more times that week, ha! Theirs was a little different. The eggplant rounds were cut into four and deep fried. Though I enjoyed the deep fried crunchy eggplant, I prefer sautéing the eggplant as I did in this recipe. It still has a crunchiness to it but isn’t as deep fried. The taste of the sauce kind of reminds me of a chipotle sauce or perhaps a Cajun seasoning. It is a bit on the “spicier” side. However, if you still want to make this recipe but don’t really like your food spicy, add less cayenne seasoning. Taste the sauce and add more if desired. Don’t overcook the shrimp. I left the tails on in this recipe mostly for photography purposes. Shrimp is better to photograph with the tail. However, I’m not a fan of trying to remove the tail mid-meal, lol. So, it’s much easier if you remove tails of the shrimp before cooking. This is such a quick dinner and it’s really easy to prepare. 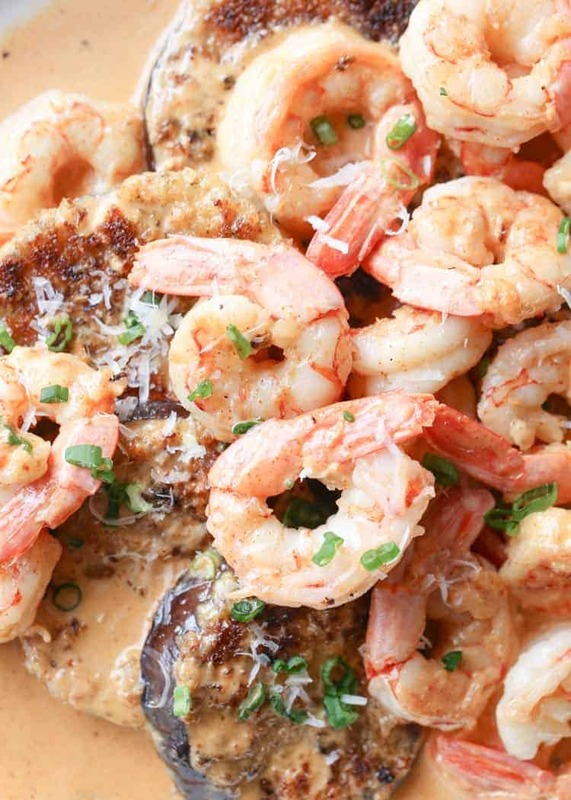 Have your side of mashed potatoes or rice started before you make eggplant with shrimp. This dish is best if enjoyed immediately so you want everything prepped. 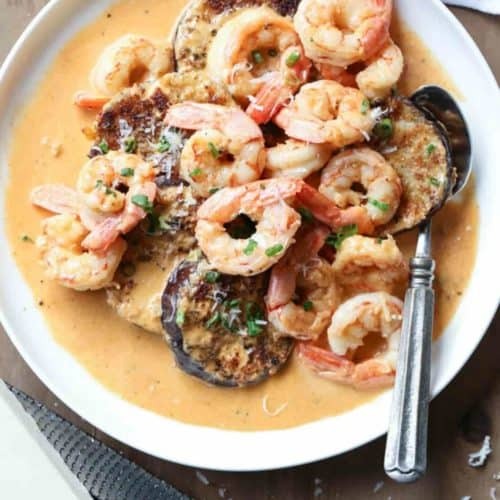 The most amazing recipe for Shrimp Eggplant Recipe in Creamy Sauce. 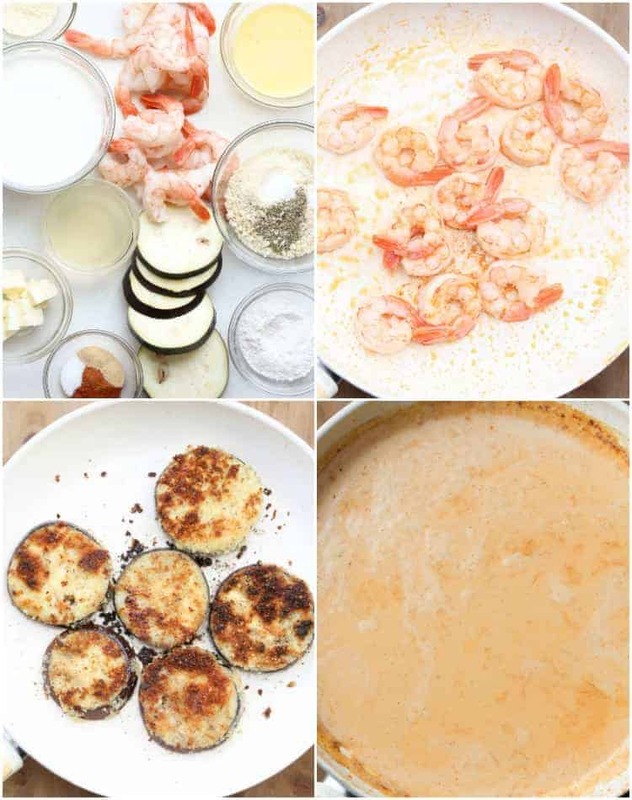 Breaded parmesan panko eggplant with shrimp in a spicy (Cajun like) creamy sauce, ready in under 30-minutes. #Winner! Combine ingredients for bowl 1. Combine ingredients for bowl 2. Combine ingredients for bowl 3. Slice eggplant into 1/2” rounds. Take eggplant slices (one at a time), generously coat into flour, bowl 1. Then dredge into egg mixture, bowl 2. Then coat in breading mixture, bowl 3. Add enough oil to lightly coat the bottom of a large skillet. Once oil is hot, add eggplant, cook on med/high heat until crispy. Repeat on the other side (add more oil if needed when flipping the eggplant). Cook until center of eggplant is soft (2-3 min on each side). Transfer fried eggplant to a plate lined with paper towel. In a large skillet, melt 1 Tbsp butter, add shrimp and cook until pink on both sides (4 to 5 minutes). Lightly salt and pepper. 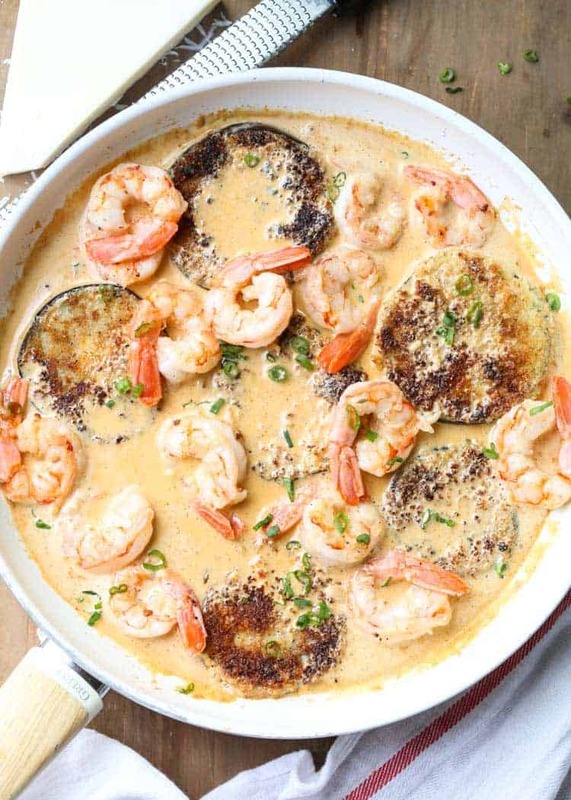 Remove shrimp from skillet (you can add them to the eggplant). In the same skillet, add 4 Tbsp butter. Once butter melts, add heavy whipping cream, Parmesan cheese, paprika, garlic, cayenne, salt and pepper. Whisk until combined, once the sauce comes to a soft boil, turn heat down to simmer. 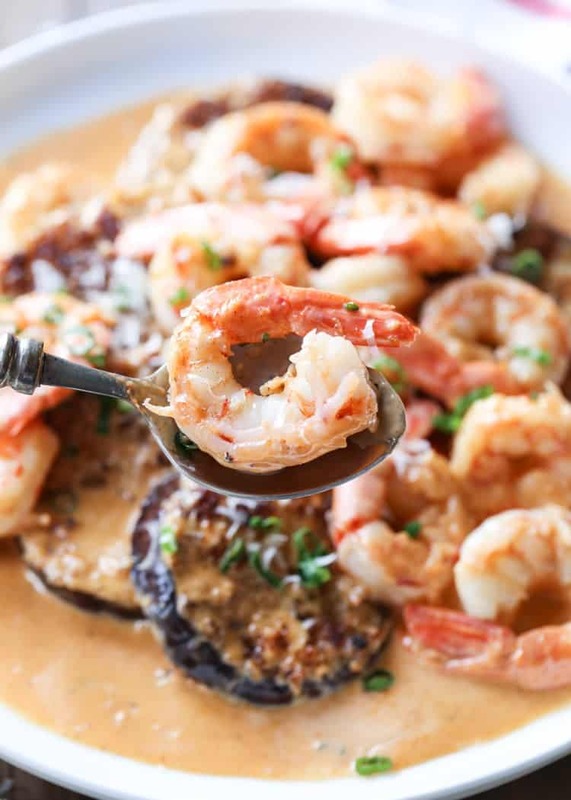 Add the eggplant and shrimp to skillet with the sauce. Cook 2-3 minutes on low/med heat until everything is heated. Coat shrimp and eggplant with sauce.